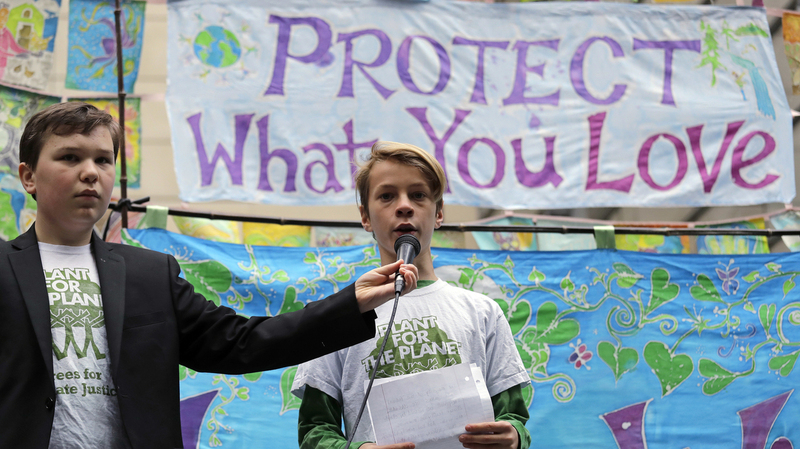 Young Activists Can Sue Government Over Climate Change, Supreme Court Says The 21 plaintiffs, many of whom are minors, say government policies infringe on their rights. "We need to as a country, do much bigger things," Leigh-Ann Draheim, the mother of one plaintiff said. The climate change lawsuit inspired this rally in Seattle, along with ones in Portland and Eugene, Ore.
A group of young people can sue the federal government over its climate change policies, the Supreme Court said Friday. Since it was first filed in 2015, the government has requested several times that Juliana v. United States be dismissed. "I want to trust that we are truly on track for trial without having further delays," Kelsey Juliana, a 22-year-old plaintiff, said in a statement, "but these defendants are treating this case, our democracy, and the security of mine and future generations like it's a game. I'm tired of playing this game." "The Supreme Court order is without prejudice and recognizes ongoing appellate proceedings in the lower courts," a Department of Justice spokesperson said in a statement. "We are pleased that it sets a path for the Justice Department to continue efforts toward dismissal of this improper case." The lawsuit — brought by 21 plaintiffs, many of whom are minors, in U.S. district court in Eugene, Ore. — claims the federal government encouraged the production of oil, gas and other fossil fuels, causing the planet to warm and infringing on several of the plaintiffs' fundamental rights. It lists examples that the government knew the Earth was warming as early as 1965, and it requests a court order for the government to decrease carbon dioxide emissions as well as the creation of a national plan to "restore Earth's energy balance" and "stabilize the climate system." "The breadth of respondents' claims is striking," the Supreme Court had said in an earlier court order. But it said the claims should not be dismissed before going to trial. Leigh-Ann Draheim, whose son Levi, 11, is the youngest plaintiff, said the case was based in part on the public trust doctrine. "People have the right to running water, clean water" and clean air, Draheim told NPR. "And then there's also the amendment with life, liberty and the pursuit of happiness. One's life is at risk with health and with having to leave our home." The trial had previously been scheduled to start Oct. 29. The group Our Children's Trust, which has provided support for the plaintiffs, said it had requested a status conference to set a new trial date. It now could start as early as mid-November, Draheim said. "I loved the environment and I love to be outside," Levi, the plaintiff, said. "And when I realized there was such a thing called climate change, I realized that I need to do something about it." At a rally in Eugene on Monday — the day the trial had been scheduled to start — Levi explained why climate change in particular had struck a chord. "I have personally had to evacuate my home because of hurricanes," he said, according to Rachael McDonald of member station KLCC. "I've seen fish kills on my beach and I have seen changing weather and more and more hot days." When The Weather Is Extreme, Is Climate Change To Blame? Levi — who was 8 when the lawsuit was first filed — and his mother have been involved in local environmental activism in their home of Satellite Beach, Fla., she said. "A lot of people say, 'Why don't you just recycle or ride your bike more?' And he does all that," Draheim said. "It's not working, it's not good enough to just get individuals to do individual small things. We need to as a country do much bigger things."